WHAT BRINGS YOU TO RANCH FOODS DIRECT TODAY? Steve: It’s a tradition. 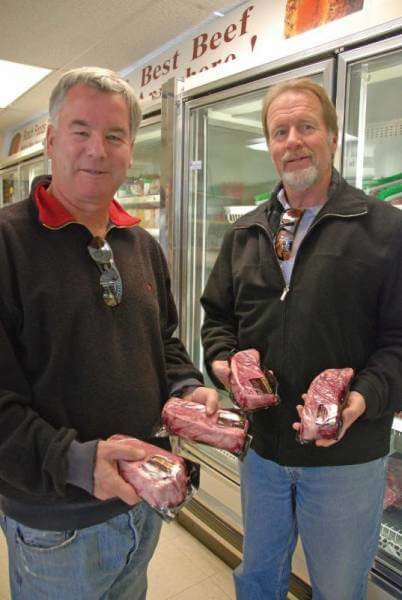 We come down here and buy steaks, freeze them and fly them with us on our annual Arizona golf trip. They go with us in our golf bag! There’s four of us guys, and we have another couple join us to celebrate a birthday party while we’re there. Scott’s the chef, and I’m the prep-chef. We do it because these steaks are the best! This golf trip is like our Christmas. Three years ago we made the mistake of waiting until we got to Arizona to buy our steaks. We’re not doing that again! WHAT ARE YOUR FAVORITE CUTS? We like the filets and New York strips. DO YOU HAVE ANY SPECIAL PLANS FOR EASTER? Scott: Lots of food and hopefully it’s warm enough to play golf! Steve: I’m starting to get in the habit of coming down to Ranch Foods Direct. I’m thinking maybe I’ll get an Easter ham here this year.